DepicT! challenges the international creative community to make distinctive, imaginative and engaging short films under 90 seconds long. Chosen from just under 600 entries from 49 different countries, the 20 films on this year’s shortlist stood out for their originality, going into the running to win one of four great prizes. Following a fantastic buzz at the DepicT! Showcase hosted by Watershed Cinema Curator Mark Cosgrove, distinguished guests gathered on the evening of Sat 20 Sept for the grand finale of the 20th anniversary edition of Encounters Short Film & Animation Festival to hear our expert judging panel’s take on the shortlisted films. The prestigious panel included some of the top names in film and television, including award-winning Cinematographer Robbie Ryan, Lara Akeju from Channel 4, Shooting People’s Sarah Chorley, BAFTA winning filmmaker Yousif Al-Khalifa, Producer Chris Auty (National Film & Television School) as well as David Sproxton from Aardman Animations, who opened the Award Ceremony to a full house. Dr David Cooke, Chair of the Royal Photographic Society Education Committee, one of the major sponsors behind the contest, presented the main DepicT! Award. British animator Ant Blades (who is behind the London based Birdbox Studio) picked up a cash prize of £1,500 and a lifetime membership to Shooting People for his rollicking animated short, Carpark. “With great comic timing, it packed a lot into 90 seconds,” said the jury, who were unanimous in their choice. Winning the DepicT! British Special Mention was Daniel Chisholm whose film Nati, is a short, honest portrayal of a 90 year old man in just 90 seconds. The jury described its maker as “an interesting voice that they’d like to hear more of.” Daniel wins a great package of career development opportunities from BAFTA, the National Film and Television School and Shooting People. Follow his progress on depict.org. Last but not least, the DepicT! Shooting People Audience Award also goes to Nati! We’d like to thank all 2,923 of you, the audience, for voting. Daniel Chisholm picks up a Lifetime membership to Shooting People. We’re also very grateful to our sponsors and supporters who enable us to run the DepicT! competition, and to all 580 filmmakers, from Peru to India, who submitted their 90 second films without whom we wouldn’t have a competition! Watch Dan’s winning film, Nati, here! Mole Hill won DepicT! 2012 with Fat Cat, his fantastic animated commentary on the desire to make excessive amounts of money. What drew you to the 90 second format? I really like the 90 second format, shorter than a short but longer than a commercial it gives enough time to tell a fairly complex story, whilst forcing the film-maker to be succinct. I’ve been knocking around for ages, I started out making shorts for C4 back in the 80s and have worked on children’s series, commercials, stings – anything that comes along really. Over the last few years I’ve started making shorts again, taking advantage of the new technologies that have made film-making so accessible lately. 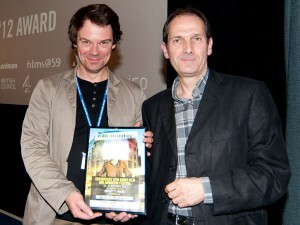 Winning at Depict was fantastic – It’s particularly good that the films get a bit of distribution after the event itself. I used the prize money to buy a camera and have started on a new short – I’ve completed the first shot, so at this rate it should be finished sometime in 2020! In 9 words can you sum up why DepicT! is so important to emerging filmmakers? A great showcase, a firm deadline, a creative opportunity.